997 in her hangar at Bellingham International Airport. One of the benefits of returning to Bellingham is flying our airplane, 997. While we're in Powell River, she patiently waits in her hangar for an aerial excursion. It may be winter, but we had five days of sunshine, even if it was quite cold. We used the time wisely. The first flight was in the pattern to practice take-offs and landings. The next was to fly to nearby Anacortes Airport to join our friends Ken and Sam for lunch. Our third flight was multi-purpose. We wanted to continue working on our currency with take-offs and landings, we wanted to exercise 997 and all of her systems, and we wanted to go out for breakfast. Skagit Regional Airport was our destination of choice. 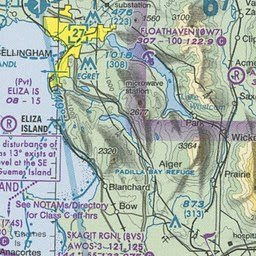 Skagit (KVBS) is located thirty miles southeast of Bellingham. It's on the coastal plain near the mouth of the Skagit River and Padilla Bay. The elevation is 144 feet (43.9 metres) and Runway 10/28 is 5477 feet (1669 metres) long. The airport with the Skagit river valley in the distance. Skagit can be a busy place on weekends with student pilots and visiting aviators, but it was relatively quiet for a Sunday morning. We had breakfast at the Flyer's Restaurant and Brewhouse (of course, we passed on the brews). Wayne's prime rib hash and eggs and my Eggs Benedict hit the spot, and the runway view with 997 sitting out front was awesome. After some much needed exercise for 997 and practice for her pilots, we headed back to our home base in Bellingham (KBLI). Final approach to Skagit Regional Airport. Really amazing to see the skies & landscape from the pilots perspective!